I love a good story. I love hearing someone tell a good story and I love telling a good story. I think we’re all natural story tellers. Since the dawn of time before people could even speak they’d sit around the cave acting out the days events. Sharing how they didn’t get eaten by a giant predator today. I think we’re so hard wired to tell and listen to stories that when someone is speaking and they don’t build it into story format, our brains start to shut down. Have you ever listened to someone speak where they’re droning on and on about nothing? You’re fighting to keep your eyes open when they start to get into a story and suddenly you perk back up with interest? The best marketing people I know of don’t sell. They tell stories. Before you know it you’re caught up in his story. You’re envisioning yourself in the story. You feel the wind in your hair as you picture yourself in the driver’s seat. Some people might think it’s a little unethical to use story telling to market something. It certainly can be. But then anything can be unethical. The way I see it, as long as you’re not lying or trying to outwardly trick the person into doing something they don’t want to, it’s all good. A great story is a way to get the prospect to get emotionally involved. And people buy on emotion and justify it later with logic. Stories remind us that we’re human. Stories allow us to see ourselves in the world. The educate us, they give us different perspectives. And of course, they just plain old entertain us. As a social media marketer, stories are a powerful tool. Look at how I write most of what I have written here. Most every post has a story to move the narrative forward. In an earlier post I told you about my friend who was Bobby Bonilla’s private chef. Before Bobby came to the New York Mets in 1999 he was playing for the Dodgers in LA. Matt got to go out and live on the road with Bobby. Even though he was working, they became pretty close friends. I have to tell you, I would count the minutes until I could speak to Matt again because his stories were amazing. I got to live vicariously through him and lift myself up out of my boring and mundane life. One day Matt called me and asked me a funny question. He wanted to know the name of the guitarist in the band Kiss. When I got to meet Bobby Bo through Matt, we immediately bonded over our love of Kiss. I grew up with them and idolized them into my adult years as did Bobby. Me and Bobby really connected over stories of listening to them as kids and seeing them live. Did you ever see the old cartoons where a characters jaw will drop right onto the floor and his eyes pop five feet out of his head? That’s what happened to me. The stories Matt told after that chance encounter just got better and better. The one that riddled me with jealousy was the time he got to go to a concert with the band… on their private jet. The story about my friend Matt meeting Kiss is an amazing one. But stories don’t need to be like that. They just need to be interesting. They need to take the reader somewhere. But it can be a very simple story. We’ve all got them. We also have stories that may seem mundane to us but to someone else, they may be the most interesting thing they’ve heard all day. I’ve told stories that I thought would put people to sleep where they hung on every word. 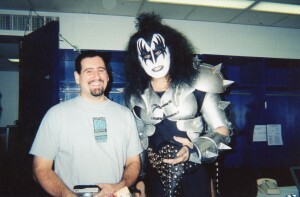 By the way, that picture to the left is me with Gene Simmons backstage. Matt was taking the picture and the rest of the band was heading for the stage. Gene looks like he’s making a rock star gesture but Matt was having problems getting the camera to work. Gene was telling him to hurry the hell up. I look pretty happy, don’t I? When I write, whether it’s a piece of content such as this, or a short Facebook status update, I always try to follow this model. Tell a story, teach a lesson. The story is used to drive the narrative forward so you can, quite frankly, have permission to teach the lesson. People don’t want to just sit and listen to you teach or preach. You might think they want to and they might think they want to, but they really don’t. They really want to be entertained. And when they’re entertained, they’ll learn more and retain more. So it is win/win. But to be effective, you have to build a bridge from the story to the lesson. They have to be connected. The story has to make sense in the context of the thing you’re teaching. Look what I’ve done in this post. How many times did I use story to drive my point home? Heck, it’s a story about a story about using a story to teach a lesson. Boy, that sounds confusing. But I think you probably get the point. You’re still reading so I have to assume it kept you interested. And hopefully, you’re going to take away the ever important lesson of using story in your content. It really works. And now, like the Cheap Trick song, it’s time to go get my old Kiss records out! (Google it).